Five cute puppies found homes * Cinq adorables chiots ont trouvé un foyer! Eva won the battle against the illness thanks to Hortence and Jonathan and is adopted! Rebeca arrived in Geneva on 21 and was adopted on 23 March 2014! Kiko & Coco, with their friend Indo arrived to SPA Arthaz on 23 March 2014 and were adopted within few days. Grace à vous, les 11 pouvent fete Noel ajourd'hui (23 decembre 2013)! Thanks to you, generous people, 11 could celebrate Christmas today (23 december 2013)! outside is white snow, everything looks nice and clean. My brothers, sisters and our friend are looking through open grids squeezing to each other. It's cold, very cold and our small bodies are shaking. We did not want to be here. We wanted to stay with our mum..our dear mum. A man took us from her and trow us to garbage bin far away from her. She run after us but they threw rocks at her ... We do not know if she survived... Only blood tracked left after her...Dark and ugly smell scared us and we cried for help. Some children heard us and took out from the bin. 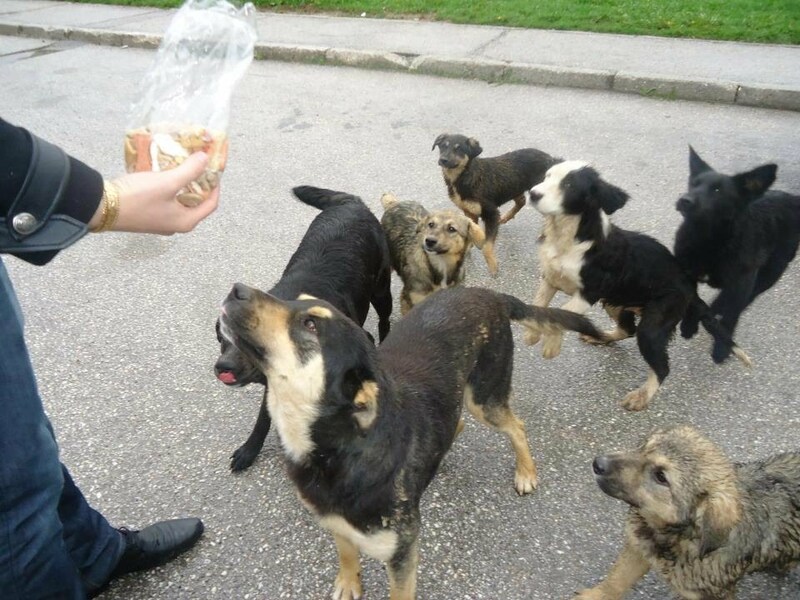 Then, a lady come and brought us to Gladno Polje "shelter". What a shelter! It is just a prison for dogs! Dear Santa, this year I want only one thing for me, my sisters, brothers and our friends: I wish for us to live! ......and I promise, promise, promise that I will be good dog. Dehors, tout est recouvert du manteau blanc de la neige, tout est beau et tout est propre. Mes frères, mes sœurs et nos amis, cherchent de la chaleur en se serrant les uns contre les autres. Puis, une dame est venue et nous a emmenés à l'abri de Gladno. Abri? C'est juste une prison pour chiens! Cher Père Noël, cette année, je ne désire qu'une seule chose pour moi, mes frères, sœurs et amis. Je souhaite juste que nous vivions... Et, je te promets, je promets d'être un gentil chien..."
When my mum was about to deliver her owner took her and left far away from city lights in woods where nobody could see and help her. She was scared and starving. She tried to find food but there were only trees and grass..After several days we were born: six beautiful balls. We were healthy, playful puppies and did not understand why our mum is often laying and do not play with us. Now I know why she could not walk..she was hungry and all her energy we were taking breastfeeding. After some time, finally, we found houses and some food around garbage bins. Our mum could not eat anymore...she got sick and one morning she did not move. Six of us tried to wake her up, licked her cold nose but she did not answer...I do not know how many days we spent with our dead mum..some people came and throw her body to the garbage bin. Few days ago I met first friendly person - a lady approached me with big can of food and cuddled me..I just felt warm tears on my fur..''Is there an end of your suffering little one..?'' she asked me. I was so happy ..she made a little shelter for me, every day I was waiting for her and food she brought to me..she played with me and kids start to pay attention to me. I had fun every day with them too. But some people do not want me to be in front of their building...The lady beg them to leave the shelter she made it for me, beg them to leave me alone, but every day they demand her to move me or they will poison me. Why? Why? What did I do to them? Lorsque ma mère était sur ​​le point de nous mettre au monde, son propriétaire l'a emmenée et l'a laissé loin des lumières de la ville, dans les bois où personne ne pouvait la voir et l'aider. Elle avait peur et faim. Elle a essayé de trouver de la nourriture , mais il n'y avait que des arbres et de l'herbe .. Après plusieurs jours nous sommes nés : six belles boules de poil. Nous étions des chiots joueurs et sains et nous ne comprenions pas pourquoi notre maman était souvent couchée et ne jouait pas avec nous. Maintenant, je sais pourquoi elle ne pouvait pas marcher .. Elle avait faim et elle nous donnait toute son énergie en nous allaitant... Après un certain temps, enfin, nous avons trouvé des maisons et de la nourriture dans les poubelles . Notre maman ne pouvait plus manger... Elle est tombée malade et un matin, elle ne bougeait plus. Tous les six nous avons essayer de la réveiller, de lécher son nez froid, mais elle n'a pas répondu... Je ne sais pas combien de jours nous avons passé avec notre maman morte... Des gens sont venus et ont jetés son corps à la poubelle. Il y a quelques jours, j'ai rencontré une première personne sympathique, une dame s'est approchée de moi avec grande boîte de nourriture et m'a serré contre elle... Je sentais des larmes chaudes sur ma fourrure .. ''Y aura t-il une fin à ton calvaire mon tout petit bout? m'a t-elle demandé. J'étais si heureux... Elle a fait un petit abri pour moi , et chaque jour, je l'attendais et elle m'amenait de la nourriture... Elle jouait avec moi et les enfants ont commencé à faire attention à moi. J'ai eu du plaisir tous les jours avec eux.Mais certaines personnes ne veulent pas que je sois en face de leur immeuble... La dame supplie de ne pas me faire quitter l'abri qu'elle a fait pour moi, leur demande de me laisser tranquille, mais chaque jour ils lui répètent de me faire partir ou ils m'empoisonneront...Pourquoi? Pourquoi? Qu'ai-je fais de mal? Sten is adopted (November 3013)! Hope his owners will get in touch with us! Sten was just few days old when somebody left him in front of the house door of one of "Cupko - Deed for Dogs" volunteers... As sad as it is that someone would abandon such a cute baby we are grateful they did it on door steps of one of us. Elma, our volunteer, took Sten in her house and cared for him until a lady with golden heart made donation to pay a foster family for him. Thanks to good people two families found the happy end! Jannet, Luca, gabby and Hugo are adopted! We hope their families will contact u ssoon. Lara, Felix and Fido wait for their families at SPA Arthaz. Our mum loves when children from the neighborhood pet us and play with us. That is the only time she is able to rest a bit, because she knows we are safe. Our mum trusts good humans, she even rolls on her back so that they can pet her belly. Good people also bring us water and feed us every day as much as they can. Two months ago, someone left 11 small pups at the parking lot where we sleep. They were so cute, fluffy, tiny and helpless. The three of us and our mum accepted them immediately. Since then, they are our little siblings, so we play with them when they are awake and protect them when they sleep, as our mother takes care of all of us. But our baby siblings did not know that they must not cross the street our mother used to warn us about. We witnessed horrible scenes... No amount of our barking and weeping could stop the big, metal machine from taking our brothers and sisters away from our family. We watched them lying on the road, we pushed them with our noses, we called out to them, we licked their tiny eyes in hope they will open, but they remained closed. Soon, we saw our two-legged friend Selma crying over them, taking them in her arms and squeezing them tightly to their chests, like they always have when playing with us and smiling at us, telling us “Good boy! Good girl!” Except, now, nobody was smiling. Mum was weeping, and we were jumping on our people, trying to reach our siblings and smell them once more, realizing we will never see them again. Out of 11, only three babies are still alive (Gabby girl and two boys Fido and Hugo). Our mother, petrified and alone in her fight for our lives, warns us every day about the street we run across carelessly while playing, but we like to run and simply forget about the danger. We know that winter is coming soon and our mum said that winters in Sarajevo are ruthless. We do not have a box, no place to hide; we cannot even rest a bit under the building stairs because people chase us away. Is there a little space for us somewhere? We are good dogs and we all love to cuddle and play. We promise to be good. We do not need a lot. Just some safety, food and a warm spot in your home and heart, and we will walk by your side evermore, looking up at you in absolute adoration as you tenderly smile down at us. Nous sommes deux familles qui vivent ensemble dans une rue très fréquentée de Sarajevo. Ma sœurJanet, mon frère Félix et moi (Luca) nous avons six mois et nous vivons avec notre mère Lara qui prend soin de nous depuis notre naissance et ne laisse jamais de mauvaises personnes nous faire le mal qu'il lui ont fait à elle. Elle est toujours là pour nous protéger, aboyer sur les gens qui jettent des pierres sur nous et nous chasser quand nous remuons nos queues pour jouer avec eux. Ne vous méprenez pas - tous les gens ne sont pas mauvais. Nous avons beaucoup d'amis humains. C'est juste que ma peur parle en premier (oui, vous avez deviné, j'ai peur des mauvaises personnes). Notre maman aime quand les enfants du quartier nous dressent et jouent avec nous. Ce sont les seuls moments où elle peut se reposer un peu, car elle sait que nous sommes en sécurité. Notre maman a confiance dans les bonnes personnes, elle roule encore sur son dos afin qu'ils puissent caresser son ventre. Ces bonnes personnes nous apportent aussi de l'eau et de la nourriture aussi souvent que possible. Il y a deux mois, quelqu'un a abandonné 11 petits chiots dans le parking où nous dormons. Ils étaient si mignons, doux, minuscules et sans défense. Ma maman et nous les avons immédiatement acceptés.Depuis, ils sont nos petits frères et sœurs, nous jouons avec eux quand ils sont réveillés et nous les protégeons quand ils dorment, notre mère prend soin de nous tous. Mais nos jeunes frères et sœurs ne savaient pas qu'ils ne doivent pas traverser la rue sans le signal de notre maman. Nous avons assisté àdes scènes horribles ... Nos aboiements et nos pleurs n'ont pas pu arrêter le grand engin de métal qui privait notre famille de nos petits frères et soeurs. Nous les avons vus gisant sur la route, on les a pousséavec notre nez, nous les avons appelé, nous avons léché leurs petits yeux dans l'espoir qu'ils les ouvriraient, mais ils sont restés fermés. Peu après, nous avons vu notre ami Selma pleurer sur eux, lesprenant dans ses bras et les serrant contre sa poitrine, comme il le fait toujours lorsqu'il joue avec nous et nous sourit, nous gratifiant de «Gentil chien! Gentille chienne! " Sauf que, là, personne ne souriait.Maman pleurait, et nous sautions sur les gens, en essayant d'atteindre nos frères et sœurs et les sentirune dernière fois,réalisant que nous ne les reverrions jamais. Sur les 11, seuls trois bébés sont encore en vie (une fille Gabby et deux garçons Fido et Hugo). Notremère, terrorisée et seule dans son combat pour nos vies, nous met en garde tous les jours sur les dangers de la rue, que nous traversons négligemment tout en jouant, mais nous aimons courir et nous oublions le danger. Nous savons que l'hiver arrivera bientôt et notre maman a dit que les hivers à Sarajevo sont impitoyables. Nous n'avons pas de niche, pas de place pour se cacher, nous ne pouvons même pas nous reposer un peu sous l'escalier du bâtiment parce que les gens nous chassent. Y a t-il un peu d'espace pour nous quelque part? Nous sommes de gentils chiens et nous aimons tous faire des câlins et jouer. Nous promettons d'êtrebons. Nous n'avons pas besoin de grand chose. Juste un peu de sécurité, de la nourriture et un endroit chaud dans votre maison et dans votre cœur, nous marcherons à vos côtés pour toujours, le regard plein d'adoration et de remerciement pour vous qui nous sourirez tendrement. Our mum Suga is one careful and precautious dog. She is quite wild and Deed for Dogs activists never managed to neuter her. Nevertheless, when she gave us birth she took us all to live near people. She is still afraid of people and very carefully approaches when they give her food. We are different and we trust people more than she does. In the beginning there was six of us. We were very young when our two brothers were killed by a car. We did not know much about life, but we were very sad about it. And then our third brother, Kobrica, was also hit by a car. We thought that we will lose him, but he survived. Today, there are lasting effects of accident. He had very bad leg fracture, and now his life won’t be easy and pleasant because on the street only strongest can survive. We were happy in out neighborhood when pack of large dogs appeared. They were not people friendly, so they started to attack and bark on people. We did not understand why they do it because the people were good to us and we loved them. Because of them, all dogs found themselves in trouble. The three of us: Vicky, Rubie and Gemma have felt it on his skin. Some people wanted us to move out from our neighborhood, so they started to throw firecrackers and stones on us. We didn’t want to move because it’s place where our friends live and they are feeding us and play with us. But, complaints and persecution were successful. One morning, vehicles from came to pick up the dogs and take them to this awful place. As the three of us are girls, and since we are friendly to people and easy to catch, we were the first on the list. That morning, our sister Gemma came up on them with her tail wagging and she was immediately caught. They tried to catch us too (Vicky and Rubie) but Deed4Dogs activists were able to hide us. Gemma had no luck. Every day we were expecting Gemma to join us. Days went by, but she was not there. And when finally Deed4Dogs activists managed to rescue Gemma, our joy had no bounds. First days Gemma was terrified and she could not relax. It took a while to forgot all she had survive. And then happiness for reunite with her sisters overwhelmed. With Vicky’s and Rubie’s help, Gemma once more become playful and happy dog. We don’t ask a lot. Just home with some food and our own place to rest, people who would have love and care for us. We don’t know if this will ever happen. But we have faith. And our human friends assured us that dreams come true sometimes. That's why we dream, and we will continue to dream. We might wake up happy. Notre maman Suga est un chien prudent et précautionneux. Elle est complètement sauvage et les activistes de Deed4Dogs n'ont jamais pu l'apprivoiser. Néanmoins, quand elle nous a donné naissance, elle a nous appris à vivre près des gens. Elle a encore peur des gens et se rapproche avec beaucoup de précaution ils lui donnent sa nourriture. Nous sommes différents et nous avons plus confiance qu'elle. Au début,nous étions six. Nous étions très jeunes quand nos deux de nos frères ont été tués par une voiture. Nous ne savions pas grand chose de la vie, mais nous étions très triste. Et puis notre troisième frère, Kobrica, a également été percuté par une voiture. Nous avons pensé que nous allions le perdre lui aussi,mais il a survécu. Aujourd'hui, il a des séquelles de son accident. Il avait une très mauvaise fracture de la jambe, et sa viene sera pas facile et agréable parce que dans la rue seuls les plus forts peuvent survivre. Nous étions heureux dans le quartier quand un groupe de grands chiens est apparu. Ils n'étaient pas gentils, alors ils ont commencé à attaquer et à aboyer sur les gens. Nous ne comprenions pas pourquoi ils faisaient cela parce que les gens étaient bons avec nous et nous les aimions. A cause d'eux, tous les chiens se sont retrouvés en difficulté. Pour nous trois, cela s'est répercuté en problèmes de peau. Certaines personnes voulaient que nous quittions notre quartier, ils ont commencé à jeter des pétards et des pierres sur nous. Nous ne voulions pas partir parce que c'est là que vivaient nos amis, qu'ils nous nourrissent et jouent avec nous. Mais, les plaintes et les persécutions ont abouti. Un matin, les véhicules sont venus pour ramasser les chiens et les emmener dans un endroit horrible. Comme nous sommes trois femelles, et que nous sommes respectueuses avec les gens et faciles à attraper, nous étions les premières sur la liste. Ce matin, notre sœur Gemma est allée vers eux avec sa queue qui remuait et elle a été immédiatement attrapée. Ils ont essayé de nous prendre aussi (Vicky et Ruby) mais les benevols de Deed4Dogs ont réussi à nous cacher. Gemma n'a pas eu de chance. Nous avions perdu notre sœur. Chaque jour, nous nous attendions à voir Gemma se joindre à nous. Les jours passaient, mais elle n'était pas là. Et quand les benevols de Deed4Dogs ont finalement réussi à sauver Gemma, notre joie a été sans limites. Les première jours, Gemma était terrifiée et elle n'arrivait pas à se détendre. Il a fallu un certain temps pour oublier tout ce qu'elle avait subi. Et puis le bonheur d'être réunie avec ses sœurs a été plus fort. Avec l'aide de Vicky et Ruby, Gemma est redevenue une chienne espiègle et heureuse. Nous ne demandons pas beaucoup. Juste une maison avec un peu de nourriture et notre propre endroit pour se reposer, des gens qui auront de l'amour et de l'attention pour nous. Nous ne savons pas si cela arrivera un jour. Mais nous avons de l'espoir. Et nos amis les humains nous ont assuré que les rêves deviennent parfois réalité. C'est pourquoi nous rêvons, et nous allons continuer à rêver. Nous pourrions nous réveiller heureux.